Develop a timeline (the job search is generally 3–9 months) and block oﬀ time on your calendar for your search. Consider taking an assessment through CCE to determine your strengths, values, skills and interests. Use Vault, O*NET, the industry resources webpages, and LionSHARE to identify and research career ﬁelds. Research the recruitment timelines of your industries of interest. Be sure to check out the On-Campus Interviewing program and resources on diversity recruitment initiatives and leadership development and rotational programs. Talk to a career counselor, professors, former supervisors, family, and classmates to learn more about ﬁelds that are of interest to you or uncover ﬁelds you might not have considered. Create an Excel spreadsheet to record contacts you have or will meet with, positions you will apply for, and organizations you want to target. If you’re an international student and plan to work in the U.S., learn about the requirements of your visa by visiting the International Students and Scholars Oﬃce. Create polished resumes and cover letters and have them reviewed by a career counselor. Ensure that your LionSHARE proﬁle is complete and accurate. Google your name to ensure images and information are professional and keep your social media proﬁles appropriate. Join LinkedIn to connect with alumni and other contacts. 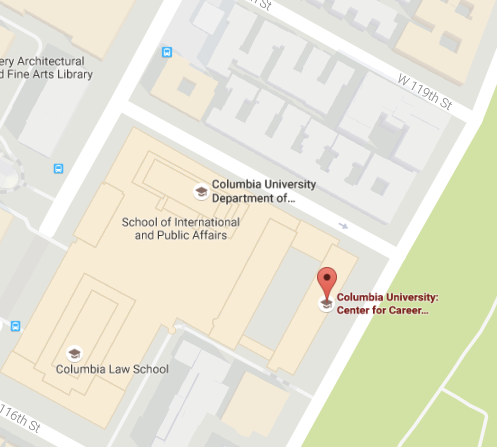 Check out the alumni page for Columbia University. Set up informational interviews with alumni or other contacts in your current network to learn about careers and organizations that are of interest to you. Actively participate in and attend career fairs, industry showcases, information sessions, networking events and workshops oﬀered through CCE. Check out networking opportunities through student groups on campus. Join a professional association and attend their membership meetings. Stay in touch with contacts you’ve made through networking to uncover “hidden” job opportunities that are not posted but rather will be ﬁlled through referrals. Create a job agent on LionSHARE to receive daily email alerts for positions matching your criteria. Regularly check the careers webpage of your top target companies, follow their blogs and Twitter feeds, and sign up for their newsletters. Pay attention to your academic department emails, ﬁnd out if they oﬀer a department-speciﬁc job board or alumni networking opportunities. Apply to jobs on industry-speciﬁc job boards like Mediabistro and USAJobs.gov and general aggregate job boards such as Indeed and Simplyhired. Schedule a mock interview to practice your interviewing skills. Set up a mock case interview to prepare for case-speciﬁc interviews (typical of ﬁelds like consulting). Research typical attire for your speciﬁc organization. Don’t forget about the Clothing Closet from which you can borrow a professional suit. Research the organization and reﬂect on how your experiences relate to the position before each interview. On the day of your interview, remember to leave suﬃcient travel time to arrive 10-15 minutes early and greet everyone with a smile and strong handshake. Ask your interviewers for business cards and send a thank you note to each person with whom you interviewed within 24 hours after your interview. Ask your interviewer or recruiter for next steps in the process and when you can expect to hear back. Don’t hesitate to follow-up if you don’t hear from them in the timeframe given. If you receive an oﬀer, let the employer know you are grateful, and ask when a decision is needed. Be sure that you have all the details: job description, salary, beneﬁts, start date, etc. Work with a career counselor to evaluate, negotiate, and respond to oﬀers. Congratulations!